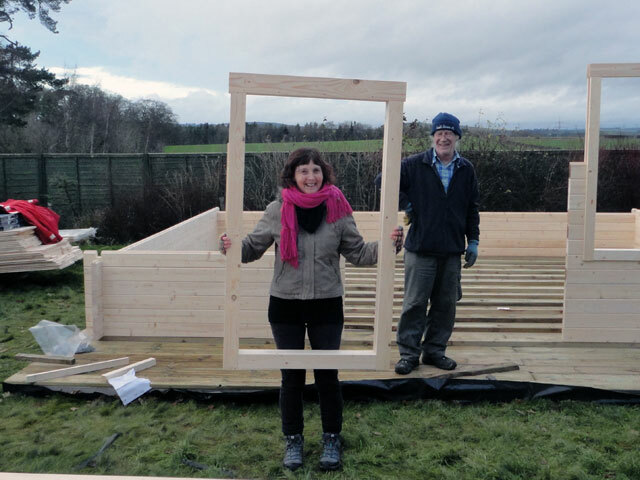 Arose early to walk Mix and to be ready for the delivery of our summer house. Went across for breakfast and enjoyed a hearty one with an ear cocked for a phone call to say that the summer house was approaching Duns. 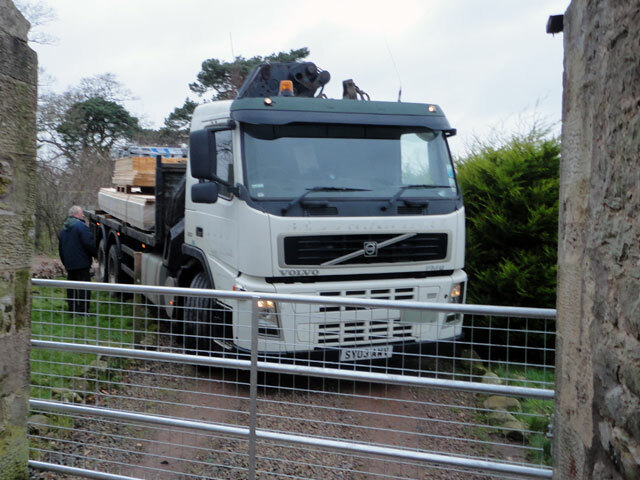 In fact Tom had phoned to say that he was having lunch before the lorry finally arrived; the driver’s mate arriving at the front door of the farmhouse and asking my sister if she was expecting a shed. A shed indeed! This is our summer house, bought with the gift given to us on our retirement by the folk of Arrochar and Luss – the place in which I am going to write my book, the place to where Rachel and I will escape to raise a champagne glass when the sun is shining down on the Borders. The driver’s mate was a real Glasgow gentleman who knew Bowling well and shared my interest in boats, so we got on like a house on fire. 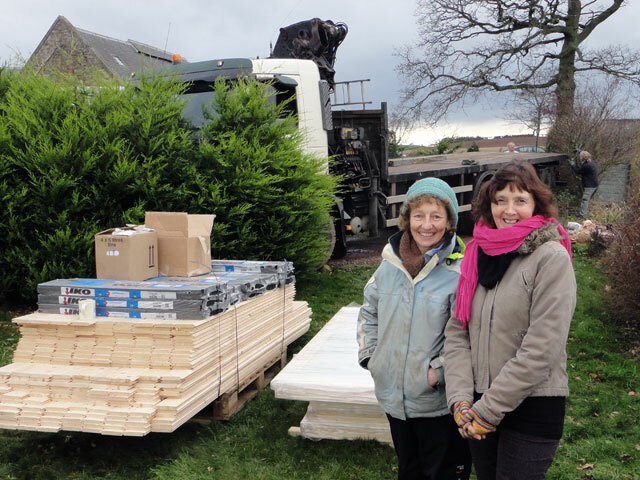 It wasn’t long before everything was unloaded, the lorry had left and work started on building the summer house. I had a great team: Tom, Digger, Neil, Rachel, Catriona and Dorothy. 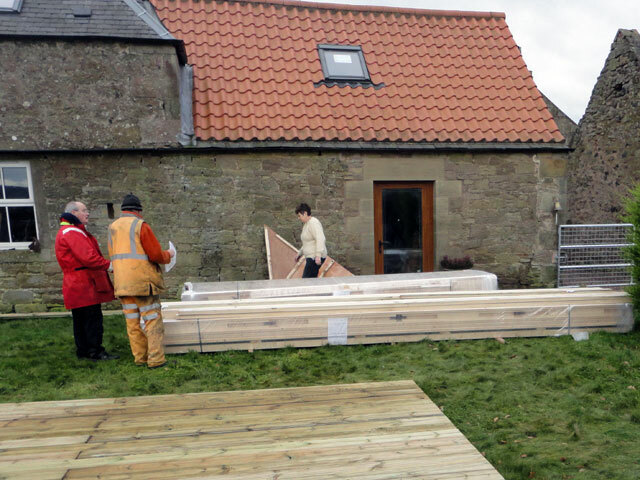 First the floorboard joists went down and then the building began to rise around them. 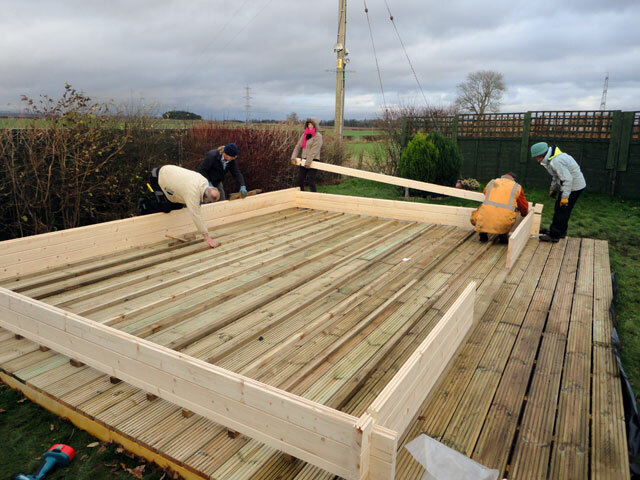 I do believe that if we had had a full day at it then we could have completed the building but days here are very short at this time of the year and we didn’t get started until the afternoon. So I was delighted with the progress we have made. However, the forecast for tomorrow is not great: we have been promised a window without rain between about nine and one in the afternoon and then, not only will the rains come down but the winds will rise. I am hoping that we might have the walls completed and the roof on before that happens. We shall see. 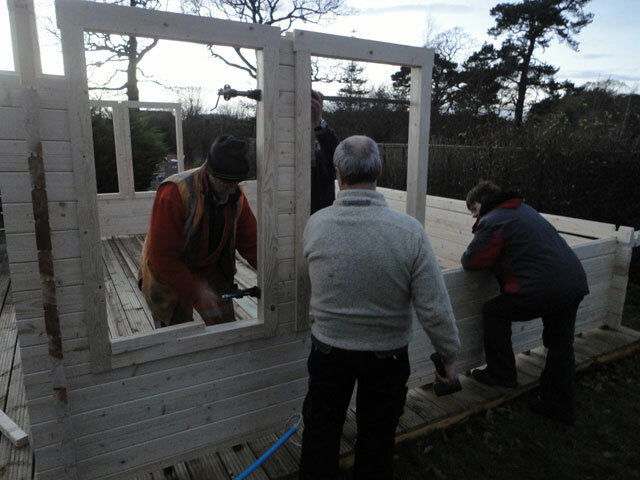 But what fun it all was and how clever the kit is – each of the pieces fits together like a jig-saw puzzle and, while I am helped by having some real tradesmen here, it would be possible for people without their skill levels to build the summer house: at least that’s how it looks so far, but then we haven’t reached head-height yet. In the evening we all dined in the farmhouse before retiring to the Granary. Mum produced an article written by a former minister of Glamis recounting the story of the Kirk there. I am going to try to type it out, it's a rather faded carbon copy, because these things are too important to be allowed to disappear. Congregations are the sum total of their story, their story shapes their future and folk need to have access to that story. I suspect that is true of families as well. Watched an episode of Rebus before bed and walked both dogs because Rachel was already in bed. I should have recorded that this morning she went off and bought chicken-wire to secure the garden (I had to stay in case the lorry arrived) and then completed the wiring up of our fences. We are secure once more.